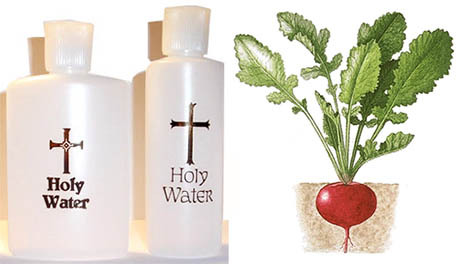 IMAGE: Bottles of holy water (available at the Sacramentals Foundation of Omaha, Nebraska) and a radish. Despite the irresistible temptation to giggle at this experiment—it, like many of my favourite examples of scientific research, has been featured in the Annals of Improbable Research—it also serves as an interesting reminder of a recurring debate in plant science: the thorny question of plant intelligence. 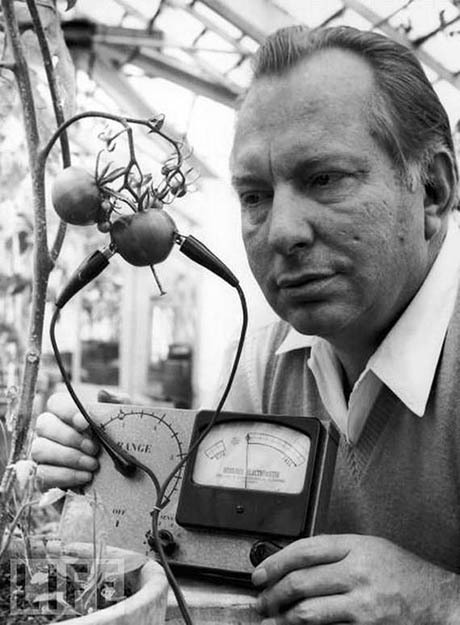 IMAGE: L. Ron Hubbard, better known as the founder of Scientology, attempting to measure whether tomatoes experience pain, in 1968. Photo: Getty Images. As Michael Pollan pointed out in his recent essay for the New Yorker, a New Age-inspired belief in plant sentience was not uncommon in the 1970s. Former C.I.A. analyst Clive Backster had spent the late 1960s measuring plant-human thought transference by attaching a polygraph machine to tomatoes and bananas, and The Secret Life of Plants was a nonfiction best-seller when it was published in 1973. 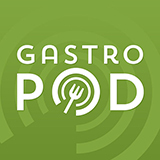 Seen in this context, Sandra Lenington’s holy water-irrigated radishes tell us less about vegetables, and rather more about humans and the limitations of the conceptual structures from within which we examine the world. What is fascinating is that, although many of these original experiments have since been discredited, botanists have recently, if tentatively, returned to the idea of plant intelligence. And, just as Lenington did in 1979, they have done so using the dominant metaphors of our time. 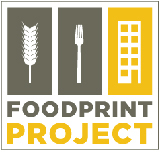 The scientists quoted in Pollan’s (fascinating) article draw heavily on twenty-first century buzz words to explain plant-based phenomena: “modular,” “resilience,” “emergent,” and “networks” are all used repeatedly. Just as the new technology of the railway provided an analogy that helped Einstein to develop, as well as explain, his theory of relativity, and just as the invention of the telephone both reflected and structured how scientists understood the human nervous system, so, too, it seems with our ability to understand how a plant experiences and functions in the world: it is both expanded and limited by the available metaphors. From telekinesis to distributed intelligence, we think like our technology when we try to think like a plant. Previously in vegetable metaphors on Edible Geography: “The Carrot Hack”. Sandra Lenington’s study discovered via @kyledropp.